Zalgiris Kaunas used a huge second half push to roll past Olympiacos Piraeus 61-79 and improve to 3-0 in Group C of the Turkish Airlines Euroleague. Zalgiris went on a 7-36 run spanning the third and fourth quarters as it snapped the reigning champions’ 16-game regular season winning streak at Peace and Friendship Stadium. Marko Popovic paced Zalgiris with 16 points and Oliver Lafayette added 10 points while four other Kaunas players hit for at least 8 points in the win. 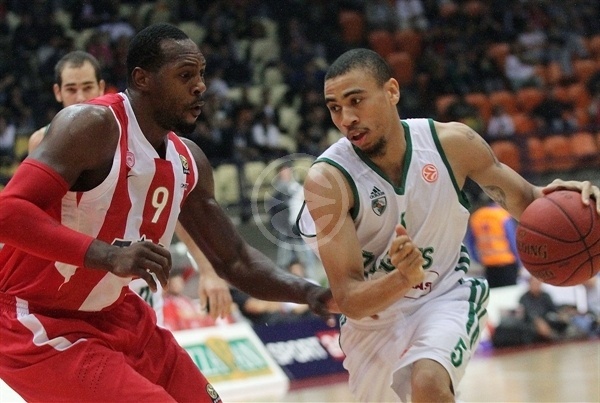 Kyle Hines was the standout player for Olympiacos with 15 points and 8 rebounds; Vassilis Spanoulis added 10 points and 6 assists. 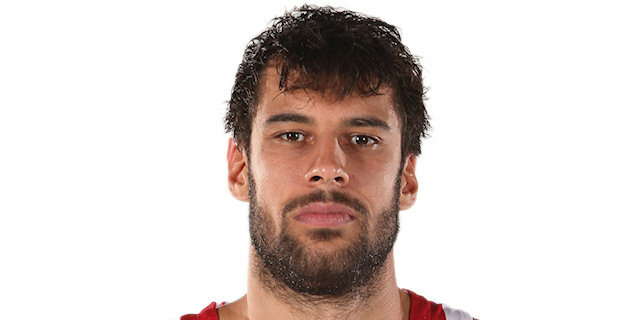 Georgios Printezis chipped in 12 points and Evangelos Mantzaris scored 11 points for Olympiacos, which dropped to 1-2 in the group. Printezis got Olympiacos on the board with an inside basket. The hosts worked hard on defense and two steals led to a Printezis dunk and Mantzaris layup before a Printezis floater made it 8-0 for the reigning champions. Zalgiris missed its first eight shots and committed two turnovers before Darjus Lavrinovic finally scored Kaunas’s first points after more than four minutes of action. A series of free throws at both ends left Olympiacos ahead 10-5 when Pero Antic streaked down the lane for a 12-5 lead. Ksistof Lavrinovic made one free throw and tipped in his missed second free throw to kickstart the Zalgiris offense. A Mario Delas jumper and layups by Tremmell Darden and Ramunas Kaukenas pushed Kaunas ahead 13-14. Olympiacos finished with the final four points though on two Antic free throws and Hines’ aggressive offensive rebound and putback as the hosts were ahead 17-14 after one quarter. Jeff Foote entered the game for the first time to start the second quarter for Zalgiris and scored over Hines. That started a back-and-forth as two Hines inside baskets were sandwiched around a backdoor pass by Foote to Mindaugas Kuzminskas for a dunk. Kuzminskas put back an offensive rebound to get Zalgiris within 21-20. Printezis answered with a long ball but Kaunas figured it needed to get into its offense quicker and Kaukenas and Ibrahim Jaaber converted layups to even the game at 24-24 midway through the second quarter. Spanoulis came back at the other end to hit a tough layup but could not convert the and-one for a 26-24 Olympiacos advantage. Hines helped his team with two free throws and a blocked shot to lead 28-24. Back-to-back turnovers by Spanoulis allowed Zalgiris to even the score as Darjus Larvinovic scored on a pick and roll to make it 28-28. Spanoulis drained a three-ball to atone for his mistakes. But Lafayette responded with a triple of his own for a 31-31 game. After the teams swapped baskets, Kostas Papanikolau scored his only points of the game on a triple to make it 36-33 and Hines tipped in Acie Law’s second free throw just before the halftime buzzer to give the reigning champions the lead 39-33 at the break. Darden’s layup started the second half before Mantzaris nailed a three-pointer for a 42-35 cushion. But the Olympiacos attack was starting to sputter and only strong transition defense by Mantzaris and Papanikolau kept Kaunas from pulling ahead – though a Darjus Lavrinovic layup and Popovic three-ball evened the game at 42-42, which sparked a timeout by the host side. The talk didn’t help as Darden raced by the defense after a switch for a layup and Jaaber nailed a long two-point shot for a 42-46 lead. The cushion grew to 45-52 on two more Popovic three-pointers and Darden’s spectacular dunk made it 45-54 with two minutes left in the third quarter. Spanoulis came back into the game and immediately stole a ball and assisted on Printezis’s three-point play. But Popovic responded by hitting an improbable hook shot late in the shot block. 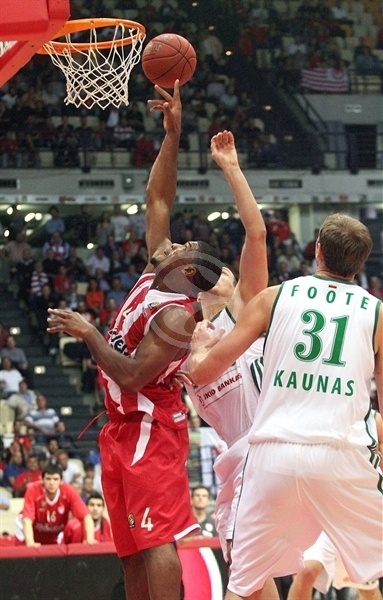 And Foote finished the quarter with a dunk just before the buzzer as Zalgiris led 49-59 going into the final period. Kaunas continued its charge in the fourth quarter with two Kaukenas layups bookending a three-point play by Foote as well as a jumper and three-pointer by Lafayette as Zalgiris went on a 0-12 run to increase its lead to 22 points, 49-71. 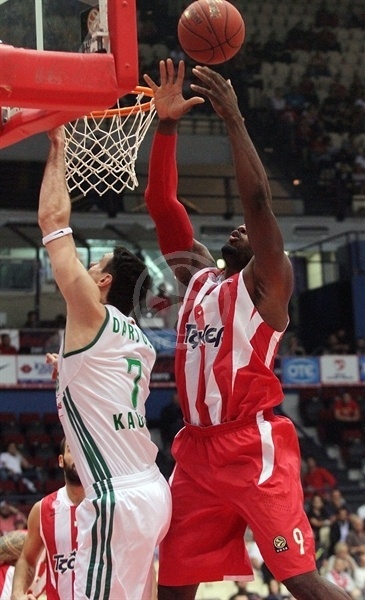 Stratos Perperoglou finally got Olympiacos on the scoreboard with a putback after more than three minutes. 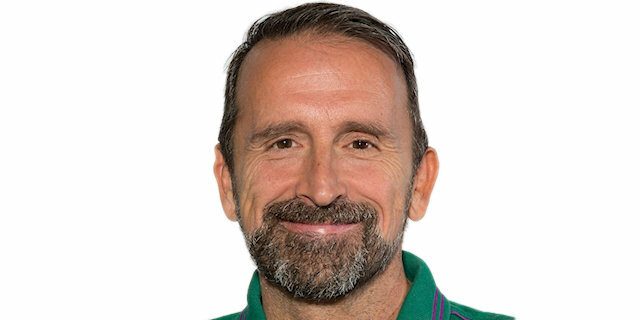 Mantzaris added a triple straight away after that and the deficit was down to 54-71 – prompting a timeout by Zalgiris coach Joan Plaza to calm his troops. Kaunas slowed down the game and it was decided for good on Darjus Lavrinovic’s triple to make it 74-56 with under three minutes to play. "We suffered a collapses in the second half and this defeat is the result. 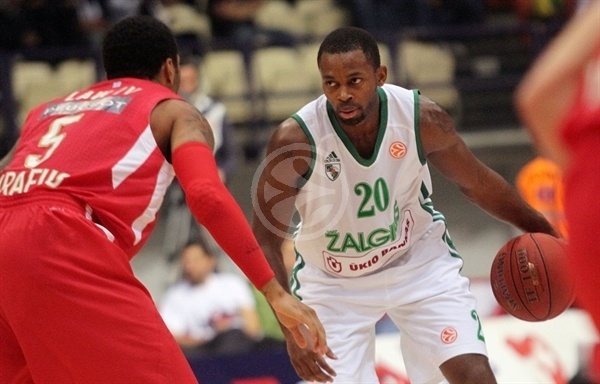 Zalgiris controlled the tempo of the game, while Olympiacos played a different game in each half. We committed 22 turnovers, which are too much and cost us a lot. There is no doubt, that we have a tough and difficult road to run, but I hope that we can do it. After last season’s triumph, Olynmpiacos is considered to be a favorite, not an underdog. But this is not true, we are not favorites. To manage a success is more difficult than to manage a failure. I don’t blame the players, the responsibility belongs to me." 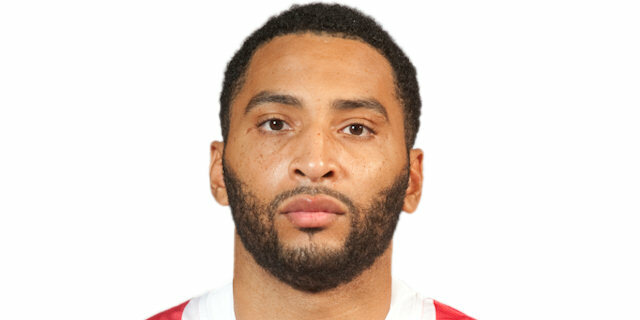 "We edged the reigning Euroleague champion on their home court and this is a very important victory. I think that Olympiacos underestimated our team. They were thinking that they should beat us with only good defense and some baskets, but we proved that it was not enough. We are trying to change the philosophy and the mentality of our team. We have to play hard and smart in every game and try to win either at home or on the road. We didn’t play good defense in the beginning of the game, but we realized the game of Olympiacos and improved our performance. Now Zalgiris needs three more wins to advance to the Top 16. I want to thank my players for the victory. It is difficult to win every night and they understand it." "This was a second straight bad game and I don’t know what to say and how to explain the situation. Maybe we will have an answer after we will watch the video of the game. Zalgiris played a great second half, they sank a lot of big shots, they were full of energy and deserved to win, while our team was unable to react." "It’s a big mistake to compare last season’s team to the current one. It’s also a mistake to say that we didn’t start well last season and we can repeat it. We have to work hard and find the solution. Today we had a very bad game and I want to apologize for this result. 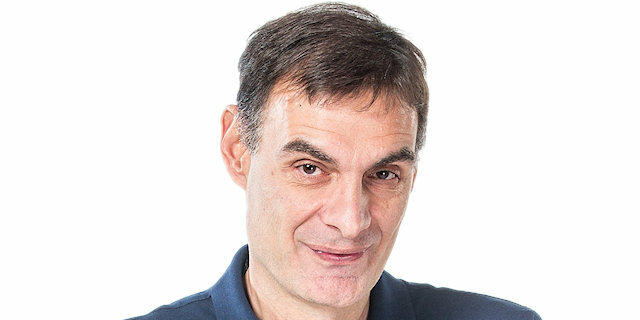 We are the defending Euroleague champions, but it doesn’t mean anything. We are in another season and we have to find the way to make it to the Top 16."